Earn $2.99 in VIP credit (299 points)What's This? Clif's recently reformulated Shot Energy Gel is a fast-acting, easy-to-digest source of carbohydrates—your body's preferred source of fuel during activity. Shot Gel's semi-liquid form shines in situations when you're working hard and need to fuel up between breaths. Clif Shot Gel is the first energy gel on the market to go Organic. Each flavor uses at least 90% organic ingredients. This means that Clif Shot Gel's not only good for you, but also good for the planet. 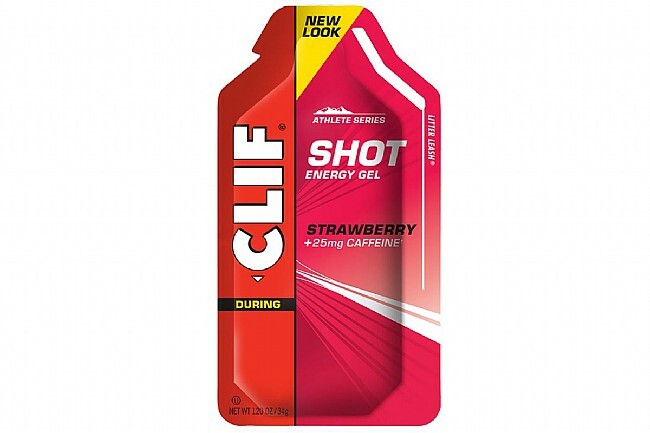 Clif Shot Energy Gel is the only gel featuring the patented Litter Leash in its packaging—a feature that makes it much easier to open a gel and dispose of it properly. With the Litter Leash, the gel tear tab stays attached to the bottom of the package after use so you don't have to worry about trashing our roads and trails while you fill up on nutrition. always down a gel after every hour on the saddle, and it seems to get the job done. the sweetness and kick of caffeine helps a lot. it's a little on the thick side, so it would be helpful to drink some liquids along with its consumption. The litter leash is a plus, you can grab it from your pocket, tear it with your mouth and down it all by using one hand. Southern Florida has two significant attractions. That is, bicycling and bicycling all year. It never stops, no matter what. So when the heat index is 105 and you are in a pace line that is cranking, pull a Gel from your short's leg and keep pedaling. It doesn't get any better folks!!! One of the Best tasting gels on the market. They do give you a 20 minute boost. I have tried many different gels over the years and Cliffs are the ones I prefer. Fast acting for a boost of energy and good consistency. Some gels are too liquid especially in hot temperatures and some are hard to get when cold. Cliffs offer the right mix. Travels well in cold and hot temperatures. Absorbs quick for fast fuel when getting low. Used in combination with Clif Shot Bloks which keeps my legs from fading as much on the longer more demanding rides.. I use this on longer rides to give me a boost of caffine and I like the chocolate with cherry flavor. It is a bit on the sweet side though, just saying. i have purchased multiple boxes of these over the past 2 years. love 'em. maybe a little pricey, but treat my stomach well, and power me through long fast rides. i also like the tear off tab which has a special piece which is easy to open but also holds the ripped part onto the whole gel packet, so that it doesn't come free and possible be littered. other brands rip right off and are hard to manage mid-race without dropping the torn off tip and littering the ground. Easy to use one-handed due to the leash that holds onto the top you can tear off with your teeth. Only downside is a sticky mess if things get out of control so usually wait until I'm stopped. Having options with and without caffeine is helpful. Tastes good and works great. I use the Mocha Gels on a ride where I know I'm going to be working hard to give me the energy and stamina that I want. I take the gel shots during rest stops on rides longer than 20 miles. I recently rode a century and took a gel shot every 20 miles. The gels aren't a substitute for food but it did help me keep my energy up between snack and rest stops. I find the fruit flavors more refreshing. The chocolate flavors are too heavy for me. Easy on the stomach, works steady. Half way thru ride of 22 miles, took a second one to get me home. Easy on my stomach, lots of energy. Especially good for early mornings as I can have less coffee at home before I leave, still get my caffiene and not worry about an unplanned pit stop - brilliant! Easy to use packet...you can tell when it kicks in. Easy to use packet. Environmentally friendly with the leash. I notice the difference about five minutes after consuming. Great product, great packaging! Great product that packs well in a back pocket. Does what it says it will do. I like the double shots of caffeine the best. Spot on taste and jolt of caffeine if that's your thing. Good value for the price point, & would definitely purchase this 24-pack option again. No complaints. Quick acting and great tast. Goes down smooth when your at threshhold.